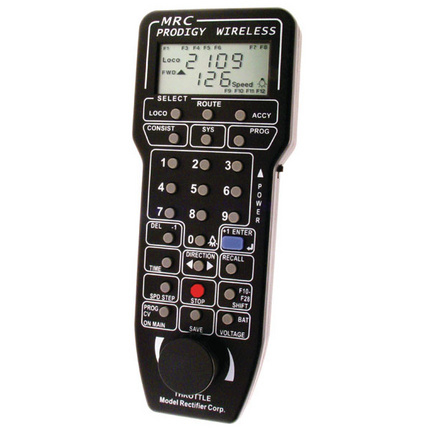 I use the MRC Prodigy Wireless DCC Command Station use on my home layout, the Chicago & South Western System. The C&SW more or less models a single town on the railroad that incorporates a small classification yard and interchange tracks to handle local traffic. The layout also features two active staging yards that represent the rest of the system and all points beyond. 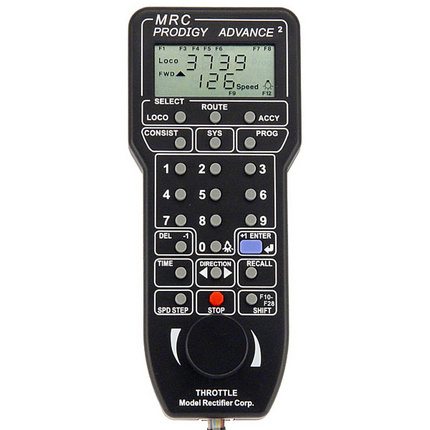 The Prodigy system is very flexible and allows you to mix and match any Prodigy throttle with any other system from the Prodigy family. The only exception is that the Wireless throttle must used with a Wireless system since all communications are sent via the airwaves. 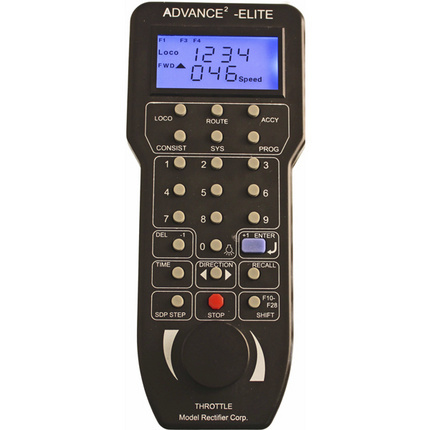 The only reason to plug in a wireless throttle is to charge the batteries. Since the wireless throttles are more expensive and some jobs, like yard masters, are fairly stationary in nature, I decided I would need a throttle bus or network for the layout. There is no reason for every job to be on a wireless cab, right? MRC offers a nice selection of fascia-mounted throttle network extension plates. One is powered, one is not. MRC recommends using one powered unit after every five unpowered units. I decided I wanted to build my own throttle network since the C&SW is cash-poor and I wanted to save a couple of dollars. The Prodigy family of command stations and throttles use standard, off-the-shelf, plain Jane, Cat 5 network cables and RJ-45 jacks. I happened to get my stuff from Lowe's but it can be found just about anywhere. The basic components are used in nearly every computer network in America any style will work. 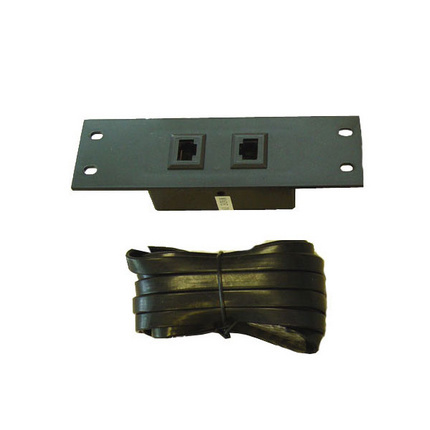 I chose the Keystone connectors because they offered matching wall plates that fit on standard new-construction junction boxes. To be sure it is mentioned, using the MRC extension plates have one very clear advantage over my throttle network. The MRC network is 100% modular where as mine home-made network is fixed and rigid. The MRC plates feature jacks on the back side so the connection between them is a simple network cable. 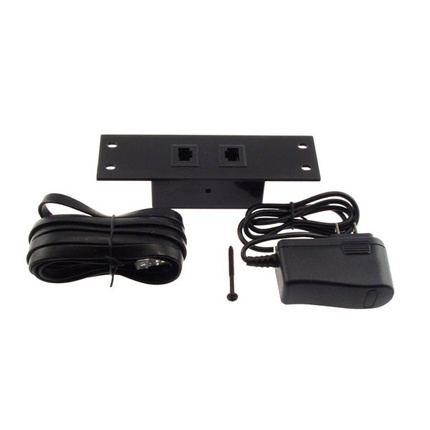 This allows them to be placed at any interval along the line and easily relocated by simply unplugging the cable and replacing with a longer or shorter cable as required. It will not be so easy to modify my network and one day, I will need to do that. To be sure it is mentioned, the MRC extension plates offer one very clear advantage over my bus. The MRC plates are 100% modular whereas my network is very rigid. I may regret that one day since my layout is still not permanent. Drill two 5/16 hole at both ends of each junction box and remove any debris or burrs. The holes can be in the side or back, whichever works best for your application. Mount the junction boxes in the desired locations around the layout. You can also just measure off the intervals for each box if you prefer to do the work at the bench. Feed the Cat5 cable through the holes in each box. Be sure to leave a piece of cable at the start of the network to plug into the command station. You may also want to leave some extra cable at the end of the network to allow for expansion if needed. Score the outer casing of the Cat5 cable with the dull utility knife. Make a second score in the casing about six inches from the first. Be careful not to knick or cut the internal wires. A dull knife is helpful here. Split the outer casing to expose the inner wires. Carefully make a six inch slit in the casing using a very sharp hobby knife. A sharp knife is very helpful here to help the knife slide through the cut. Remove the casing and separate the the inner wire pairs. Apply lubricant to the exposed portion of each pair of wires. Gently insert the two screw drivers in the center of the exposed part of a pair of wires. Gently move the screw drivers away from each other to separate each wire. Lay the exposed, separated over each of the keystone connectors as shown. Just follow the color codes shown for type B. 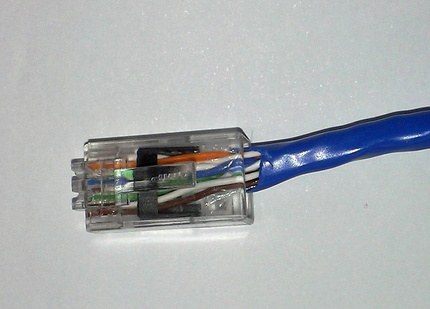 Use the special "punch-down" tool supplied with the connectors to push the wire down into the contacts. The contacts are an insulation displacement type that pierce the wire insulation to complete the circuit with inner wire. Secure the face plate to the junction box and repeat for each box on your network. 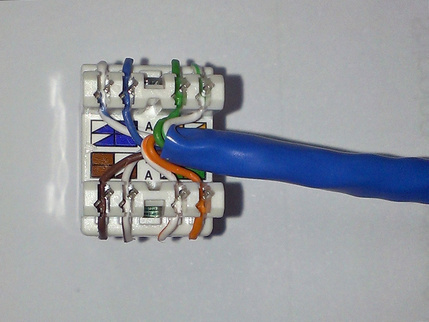 Install a single connector at the end of the network to all for expansion later the same as in Steps 10 and 11. 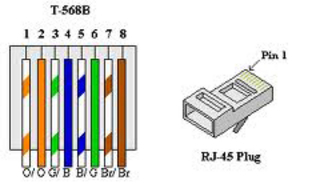 Crimp a RJ-45 jack onto the starting end of the network. Simply plug in your new network and put your crew to work. The C&SW network is about 80 feet long and has ten junction boxes or twenty cab jacks. I have used as many as four wired throttles plus two wireless throttles on the network without any issues. I do not have any additional power supplied to network beyond what is provided by the command station. I am able to easily add a MRC 1502 Powered Extension Plate using the jack at the end of the bus or maybe even build "home-made" solution if I ever start to have issues with the network. Throttle cables follow the same T-568B standard.